Since Benjamin was born we’ve been using Pampers premium protection nappies. They’ve worked well for us, don’t leak, are a trusted brand name… but they are fairly pricey (£8 for 50 size 3 nappies). I tend to bulk buy them to cut costs but this means if Benjamin goes through a growth spurt I will have wasted my money. I’ve been meaning to make the switch to a supermarket brand for awhile now. I was looking at Sainsbury’s as they are the nappies I used for my older two when they were Benjamin’s age, however, as we now shop in Asda, it makes more sense for us to be able to pick up a pack during the weekly food shop. 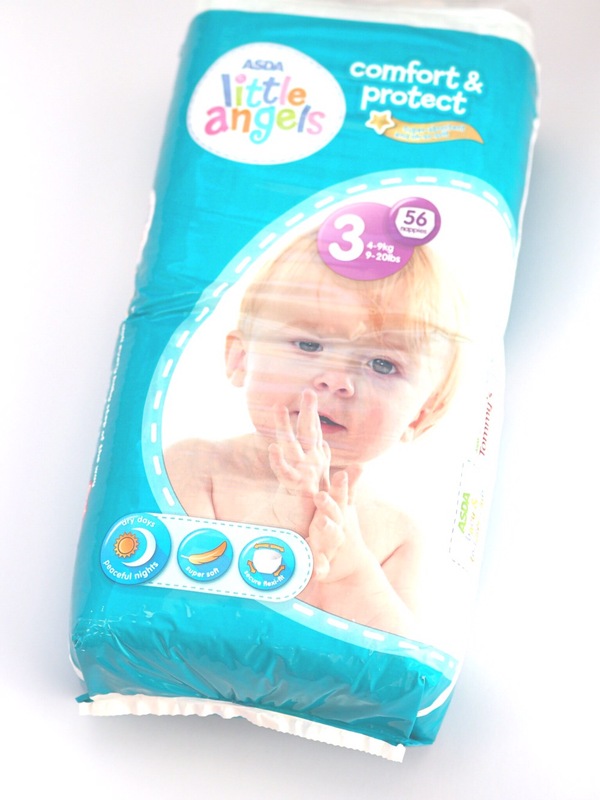 Myriad PR’s offer to send a pack of the new Comfort & Protect Little Angels nappies couldn’t have come at a better time. We’ve been able to sample the new nappies and I’m really relieved to discover that the little angels nappies are just as good as Pampers plus they have the added bonus of a cute whale design (I’m a total sucker for whales on baby things). The nappies promise up to 12 hours of dryness thanks to their gel beads which can absorb up to 30 times their own weight. I can’t say I’ve left a nappy on for 12 hours, as even when Benjamin decides to sleep through at night it’s only for around 9 hours maximum, but I’ve used the nappies for Benjamin during the day and the night and so far we’ve had no leaks (bar the most explosive poonami I have ever come across, but I’m pretty sure no nappy would have been able to restrain that particular poop!). Due to the featherlight material, the nappies are nice and soft inside, which is definitely a big plus point for us. Something I love is the handy indicator on the nappies to show when baby is growing out of a size of nappy. The tabs fasten in the coloured area when the nappy fits well, but will move into the white area when baby is getting bigger, handily indicating that it’s time to move up a size! The price, as you can expect from Asda, is fantastic, a 56 pack of size 3 nappies costs just £3.50, with the bigger value pack with almost 100 nappies available for a fiver! The only thing missing in comparison to the pampers nappies is the distinctive blue line indicator for wet nappies, although this isn’t as important now Benjamin is getting older, and with regular nappy changes this isn’t an issue (besides, I think it’s fairly obvious when he’s done a big wee anyway). I’ve heard that some people prefer the old Comfort Dry nappies but having not used the old style, I can’t compare. All I know is we’ve been using the nappies for the past week and I will definitely be making the switch to the little angels brand when we next run out of nappies. We were sent a pack of nappies for the purpose of review, however all views and photos are my own. We used these for a brief while. I did prefer the old style but there isn’t much of a difference. Nappies are so expensive. We don’t use them anymore but often used these ones too. We are waiting for samples of the pull up nappies from little angles and the swimming ones. Can’t wait for the little one to try them and see if we can save some pennies!